This dish was an outstanding success. The tastes blended really well together and the textures were wonderfully complimentary. Wood ear mushrooms (木耳, mùěr), which are usually sold dried and need to be soaked in warm water before using, have an earthy but still fairly light flavor and a pleasant crunch. And, of course, anything with bacon is always phenomenal. I used American bacon smoked with apple wood. China has rich tradition of smoked and cured meats, but Chinese bacon is different than western bacon. Chinese bacon is frequently spiced with star anise and clove, and purchased more commonly in sturdy chunks rather than the fine soft slices we’re used to in America. I will explore that tradition in other posts. For now, this dish uses American bacon… and uses it extraordinarily well. Soak the dried mushrooms in lukewarm water until thoroughly soft. Fry the bacon lightly; it should be very gently crispy in places but mostly still fairly soft. You’ll want to cut the bacon into bite-sized pieces before frying. After soaking the mushrooms, cut or tear them into pieces of similar size. Cut the tofu into bite-sized triangles. I started with a traditional block of tofu, about 4″ x 3″ x 2″. If you have a block that size, you can make triangles by first cutting it into three 4″ x 3″ slices. While keeping the slices stacked on top of each other, cut them into quarters and then cut each quarter on the diagonal. This yields 24 identical triangles. Fry the tofu slices briefly in the fat left over from frying the bacon. 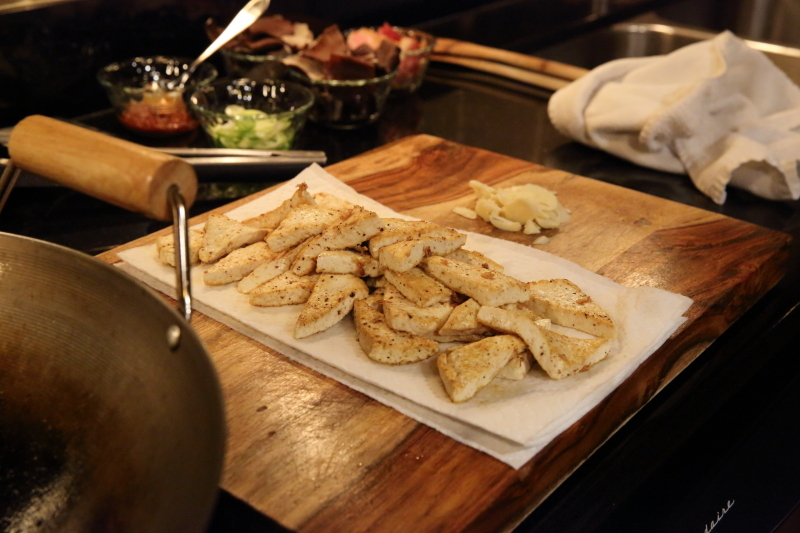 It’s best to fry the tofu in batches so that you can treat the triangles gently. You don’t want to have any heavy stirring. To assemble the dish, put the mushrooms and bacon back in the wok with some garlic and spicy bean paste. Then gently add the tofu and stir until everything is hot. You will love this, I promise. The recipe looks a bit fussy, but as usual for this blog, cooking and prep are actually simple and fairly quick. Heat your wok on medium heat until hot but not smoking. Add the bacon (#1) in batches so that each piece can lay flat against the bottom of the wok. Let it fry until it just begins to curl, then turn and continue cooking for another minute or so. Remove the bacon to drain on a paper towel. Repeat until all the bacon is cooked. It should be gently crispy in places but overall still flexible and soft. Bacon fat will have collected in your wok at this point. Heat it until hot but not smoking, and then add the tofu (#2) in batches, frying on each side like the bacon. Treat the pieces gently so that they don’t break up. Remove them to a paper towel to drain. Make sure the bacon fat in the wok is once again hot but not quite smoking. Add the mushrooms (#3) and stir-fry to heat, perhaps one minute. Then add the garlic (#4) and continue stir-frying for another 30 seconds. Next, add the Sichuan peppercorns and the bean paste (#5). Stir-fry everything for another half minute. Stir in the water and soy sauce (#6), heat until just bubbling, and then add the tofu back to the wok. Stir gently until everything is heated through. Garnish with some chopped scallions in the final stir. Variations: you can make a successful vegan version of this dish by omitting the bacon and substituting the caps of shiitake mushrooms (known in China as black mushrooms, 香菇, xiānggū). You could also substitute non-cured bacon (which is just sliced pork belly). You could also try using fresh chili peppers instead of the spicy bean paste. This entry was posted in Meat, Mushrooms, Pork, Recipes, Stir-fry, Tofu, Vegetables and tagged Asia, Asian food, bacon, China, chinese food, mushrooms, pork, tofu. Bookmark the permalink.